Ícones, 2016, golden ink on punch cards. “No work, even the most mechanical one, can be reduced simply to alienating efforts. Any person who has ever worked knows that. Work is also a place for meetings, talking and having fun,” writes curator Rodrigo Naves about the tensions and contradictions explored in the piece “Ícones” (Icons), composed of painted punch cards, that is a centerpiece of the solo exhibition “Fragmentação Peso Leveza” (Fragmentation Weight Lightness), by Manuela Costalima. A graduate in Architecture and Urban Planning at the University of São Paulo (FAUUSP), which is situated in a building conceived by the brutalist architect Vilanova Artigas, Manuela brought to her artistic practice the legacy of her ten years of studies within that building: the tension between weight and lightness and the truth and simplicity of materials. 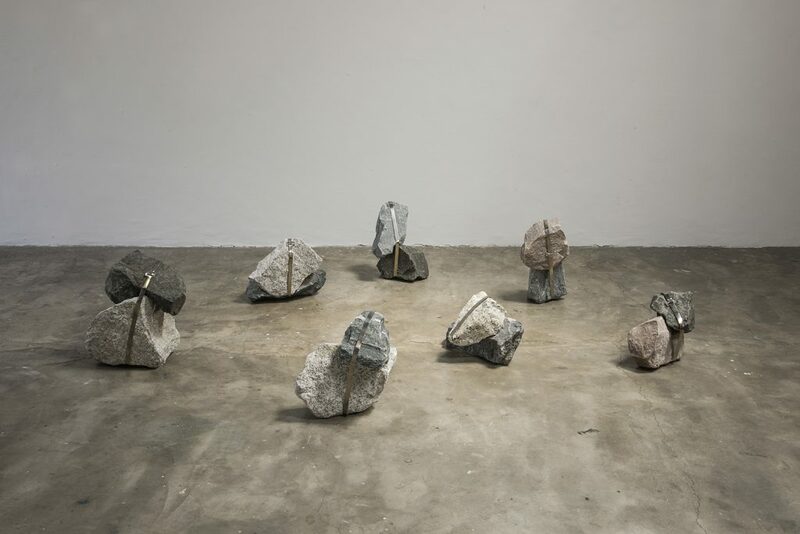 Through these materials, the artist has developed works that occupy the realm between constructed, planned space and the deviations that arise from the passage of time and the impact of human actions. Guided by these concepts, the artist usually develops site-specific works. 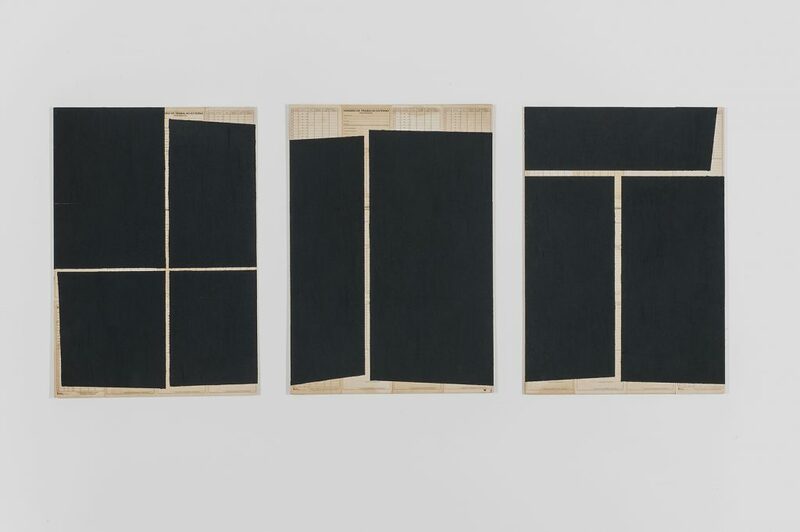 For this new show, she presents two wall pieces—the aforementioned “ícones” (Icons) and “As Horas” (The Hours), along with two installations,”Granadas” (Grenades) and “Livre Arbítrio” (Free Will), these last two organized irregularly into space in order to dialogue with the two pillars in the center of the gallery, thus inviting the public to follow a non-linear path. In this way, it offers some surprises to visitors while reaffirming time as a transformer of the human experience. Just as none of her painted punch cards could be the same as the other, no day in our lives is the same as another. Cobblestone, tubular lamps, steel, rocks, brittle, concrete: many of the materials you select for your work reveal much of your background in architecture. Tell me about this influence on your artistic practice and about the transition from architectural making to artistic making. I spent ten years studying in the building of FAU, a huge box of concrete that floats. The experience of this tension between weight and lightness struck me deeply and manifests itself even today in my works. The “Brutalismo Paulista” also ended up drawing my attention to certain materials: concrete, stone, crushed rocks, steel, coal. I search in them for the materials’ truth and a certain simplicity. There were few moments when I saw myself as an architect, I think that FAU has always been a space of experimentation for me. So I have some difficulty punctuating the transition between the architect and the artist. Perhaps the architecture has played more of a role as a trigger: in FAU I fell in love with the city, and in this space, through photographs and urban interventions, I believe that an artistic making has begun. You once said in an interview that you usually work with the space identity in which you will exhibit. Was it the case of Galeria Virgílio? How do the works interact with that exhibition space? Space has a great importance in my work and I try to reflect this in the way I conceive my shows. I have artworks that can be called site-specific. The relationship they have with the places in which they are implanted is such that they have their meanings completely altered when they are moved. I have just returned from an artist residency in Cerveira, Portugal. There I created a work (“Esteios”) that was located in the public space referring to its architecture and culture. That work would lose its justification if it were presented here in Brazil, for example. In this exhibition at Galeria Virgílio, I believe that the works have more autonomy. In any case, the spatial question remains. The room in which I am exhibiting has two pillars on its central axis. I used these elements to think of an uneven disposition of the work on the floor. This irregular occupation of space and the presence of the pillars end up guaranteeing some surprises to those who visit the exhibition. These elements invite the public to a non-linear path and a rediscovery of the works depending on its position in the exhibition space. Livre Arbítrio, 2016, rubber blanket over led lamp and steel wire. You work with “given objects,” as you once stated, but you always imprint something subjective onto them. 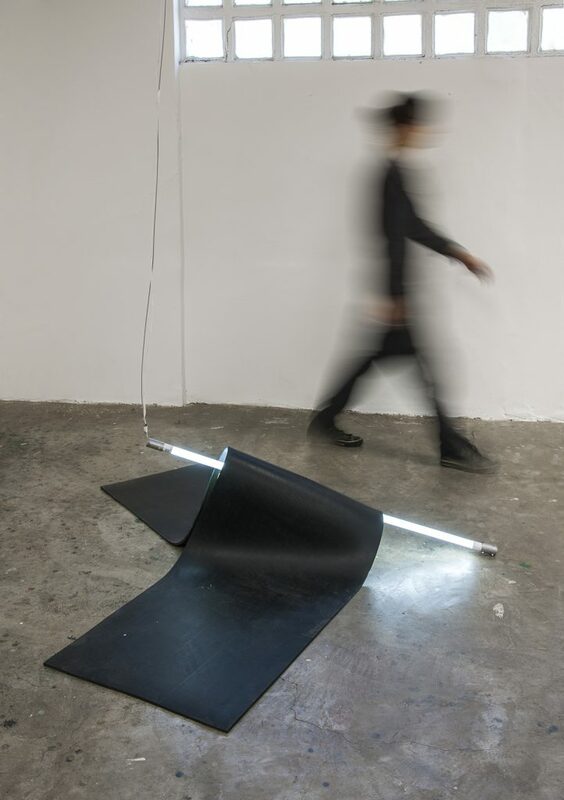 The punch cards have gained geometries in coal paint, the rubber blanket overlies the LED lamp, the two crushed stones are joined by a steel strap. How does this process unfold with these objects? My work stems from this relationship between the planned, constructed and orderly world with its industrialized and serial objects and the human experience that adapts, gives life and brings new meanings to what was static and impersonal. I try to show this when I break a stone cage [“Gabião”]—a piece of engineering created to contain walls in the roads; when I use Google Street View to send postal mail to people around the world that appear in the program photos; when I join the pairs of stones with stainless-steel straps or when I partially cover the punch cards with golden paint. Walking is also part of your process, right? Was this act present in the conception of the show? If yes, in which way? For some time the walk was central to my work. Almost all of my works came from walks around the city (initially on the actual streets, secondly, virtually on the computer screen via Google Street View). In this exhibition, curiously, there is no work that relates directly to walking. Perhaps this is a little evident in the arrangement pairing stones across the floor of the exhibition space. The stones invite a non-linear path through space and depend on it to be appreciated in their entirety. “Granadas” carries a dubious mixture between tension and affection. What was your real intention here? These pairs of stones seemed to exist like this forever. It was interesting to find each of the pairs, after some time looking for possible fittings between several crushed stones that had been available in the studio. It was as if the stainless-steel clamps were installed only to confirm these joints. Still they seem to be about to explode (hence the name, “Granadas”). It is precisely in this tension that the work happens. As Horas, 2016, carbon ink on punch cards. In “Ícones” (golden ink on punch cards) and “As Horas” (carbon ink on punch cards) you humanize a mechanical everyday procedure that is totally related to time and body energy. It does not seems to me that there is a criticism of this procedure but perhaps a way of revealing an inherent poetics. Do you agree? I am attracted to the idea of an open work, which gives rise to the most varied interpretations, but in fact my position in creating these works was not of criticism or social denunciation. Both in “Ícones” and “As Horas,” I was fundamentally interested in the question of time and the human experience that transforms and and input meanings in everything that permeates it. None of the punch cards painted could be the same as the other, just as no day is the same as the other.